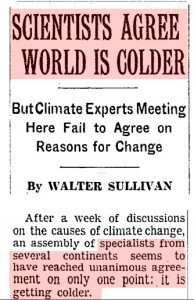 In 1961, 100% of scientists agreed that the world was getting colder. NOAA has continuously and repeatedly tampered with the data, and now has made all of that cooling disappear. Thank you, Steven, for identifying government liars disguised as federal research agencies. Today Steve Milloy correctly identified science whores in once prestigious academic institutions. I deeply regret that such blunt statements may be necessary to restore sanity to our deeply troubled society and reverse the corruption of science. For a few dollars of my money you can control the climate? Less hurricanes, droughts and killer heat waves? Gee sign me up. Gosh, you government types are the best. Me too. Are they okay? That link cost me over a week. Maybe I just read faster than them. Gail said a month ago she was having computer problems. I AM UPSET. She is fabulous here. What dates apply to these graphs? ………………..a monthly newsletter (on real paper) about energy. What? You’re not a subscriber? There’s a remedy for that! Tony, you need to get with the times. 100% is so 40 years ago. 97 is the only number that matters today.